So you know how partial I am to vintage, right? No tour of CHA would be complete without a stroll through all of the fun CHA vintage-loving booths! Today and tomorrow we'll get our 'vintage' on and take a tour through Crafty Secrets, Jenny Bowlin, Graphic 45 and Webster's pages. Utterly heartstopping! Here's Sandy Redburn, the talented owner of Crafty Secrets, and the person with the best eye for sweet vintage images that I've ever known! Sandy released 11 stamp sets at CHA; you can see close-ups of all of the sets on the Crafty Blog HERE. 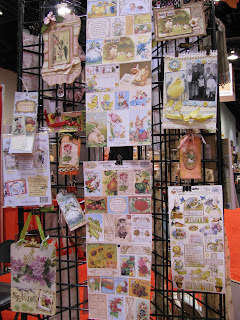 Sandy is also coming out with a new product for us cardmakers, called 'Vintage Scraps'. 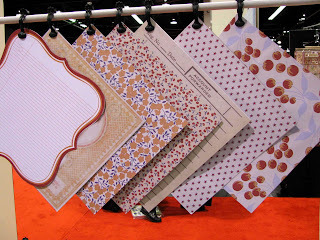 You can mat them and use them on cards or put them on your scrapbook pages. They are printed beautifully on a matte cardstock, and they are absolutely GORGEOUS & bright! I cannot wait to get them in my hands and start playing with them! Here's more samples from the booth! The Jenny Bowlin booth was as GORGEOUS as ever! 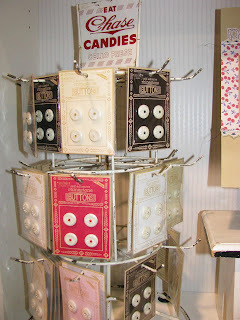 She has a new line of sweet vintage buttons on cute little vintage cards. I wanted to go junking in her booth! 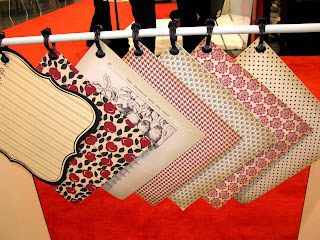 The new Jenny Bowlin paper lines are cheery and bright and my FAVORITE color, RED! I'll be getting the smaller patterned ones for sure! 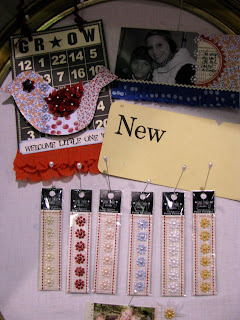 Jenny Bowlin also has a new product out, that looks like little pearl flowers in different colors! 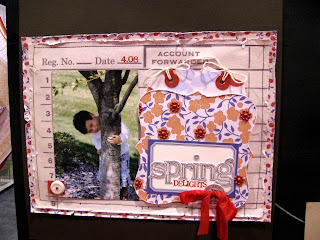 Look how cute they are, paired up with the patterned papers! Chipboard BUTTONS! SO STINKIN CUTE! Tomorrow: Graphics 45 & Webster's pages. Love seeing all the new goodies coming out!!! Thanks for sharing! Oh my goodness! 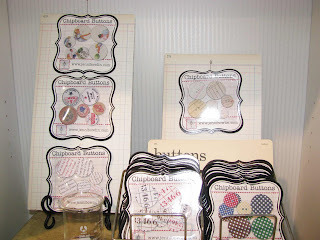 Love the buttons and the paper and, well, everything! Thanks for the awesome pictures! Thanks for sharing these new goodies ... I'll certainly be keeping my eyes peeled for several of these!!! 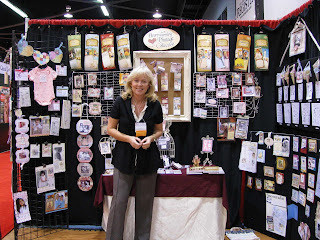 Great photo of Sandy & her goodies ... someday I'd love to meet her in person!!! BTW... your new blog header is AWESOME!!! Goodness, I missed those little pearl flowers. Must have!! Thanks for such a fun class -- I will not be hesitant about doing vintage now! So very nice to meet you!! Thanks for sharing your pics, Lisa! 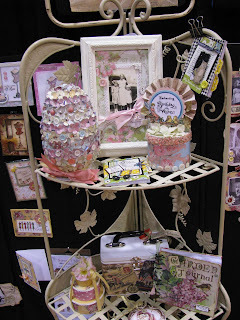 The Jenny Bowlin goodies look awesome and can't wait to get my hands on the new Crafty Secrets treasures! Lisa ... you have the bestest eye at CHA! Oh, happy day! LZ posts her pics! I can see why you were in HEAVEN!! Perfect Zappa things there! LUCKY YOU!! You got to go! !